Have you done your 2011 taxes? Even if you use a popular computer program it still takes the average Form 1040 taxpayer 26.4 hours! The Internal Revenue code is around 9 million words and is more than 18.9% larger than 1995! This year the "simple" IRS form, 1040-EZ, has 41 pages of instructions! Compliance is costly, and a total economic waste, of billions of dollars each year! TCR suggests it's time for a simple, predictable flat tax with two rates and eliminating all deductions except mortgage interest with a cap, charitable deductions and higher education expenses. We also suggest two credits, one for earned income and another for health insurance, eliminating it for business which allows portability with individual ownership of their policies. Under this plan by the Heritage Foundation, no more payroll tax, minimum tax, excise taxes and death tax, all of them gone. While the Department of Labor "says" unemployment is down to 8.2% in March, the facts are quite different. In the March report, 164,000 Americans quit the labor force and if we count those who have given up looking for work, the real unemployment rate is 9.6%! Another reason the Obama Recovery for many is a cruel joke. The battle between pro-life and pro-choice political forces continues to this day. Many pro-lifers have stated if we are ok with aborting babies in the womb then the next step was post-birth abortions. Many laughed and said it was a ridiculous concept. So as many feared, the concept of life is in fact continuing to be under assault. Next up for the anti-life forces is to kill the elderly when their "relative value" is insufficient. As a long-time leader of the Harris County GOP, your editor helped usher in scores of converts to the cause and they are always welcome. But at TCR, we have a pet peeve and that is people who come to the party who are misleading about their political history. The poster child this cycle for misrepresenting themselves is Harris County judicial candidate Kristin Guiney. TCR has identified and documented false statements and misleading misinformation put out by her and her campaign. She is a poster child to never forget President Reagan's admonition to trust, but verify. Guiney is a "life-long Republican." Guiney's voting history reflects GOP primary votes in 2008 and 2010. Guiney is a "long-time Republican" activist. Only if we define long-time as starting in 2011 when she first appeared at GOP women's clubs as a candidate. Guiney is a loyal Republican. No record of donations to non-courthouse Republicans, but her husband gave a $1,000 donation to Democrat Ron Kirk vs. GOP Conservative Senator John Cornyn. Guiney doesn't accept appointments to represent defendants from leftist Democratic judges. Pants on Fire here - Guiney has a cozy relationship with the poster child for bad left-wing Democratic judges - Kevin Fine and she has taken over 70 cases in the last 18 months from him. Contrast this with many GOP defense attorneys who have done NONE in his court. 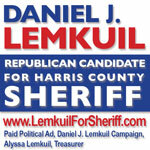 She has campaigned against Judge Kevin Fine as what is wrong with the Harris County courthouse. Hypocrisy award here for Guiney and TCR wonders whether Judge Fine knows you accept appointments in his court during the day and then attack him on the campaign trail at night. This is why we need to look at newcomers critically and not accept their story at face value. As Guiney has demonstrated, some are not truthful. We don't need converts like this in the GOP and that is why TCR is proud to support Lana Shadwick for Harris County District Court 179th Judicial District in the May GOP primary. Lana Shadwick is qualified to be a Criminal Court Judge and she is qualified as a Republican. For 20 years I have known her to be a conservative Republican who has been working hard for our core values. Her experience as a judge and prosecutor make her ready from day one to be a fine judge. She is dedicated and tough, but fair, and will make us proud. A few weeks back I took on our federal employees for being delinquent on their taxes to the tune of $1 billion. I received some criticism for that article, principally from readers who thought that government employees were being unfairly singled out. But just as that column appeared, the government confirmed what most knowledgeable people already suspected: federal employees are significantly overpaid. In January, the Congressional Budget Office (CBO) released a comprehensive analysis of wages paid to federal employees. The report revealed that during the period of 2005-2010, federal employees were awarded much higher compensation than equivalent workers in the private sector. This doesn't really surprise a lot of people, but the unfairness of this has not buried the media types. Predictably, public-employee union representatives disputed the study, accusing the CBO of comparing apples and oranges because of an alleged mismatch in educational backgrounds and work experience. But, in fact, the CBO had defeated that argument by partitioning their analysis into five groups: high school diploma (or less), some college, bachelor's degree, master's degree, and professional degree or doctorate. Only the last of these groups fared better in the private sector; and, I suspect that if they separated out those with professional degrees, the analysis would show that federal employees with doctorates are also far better compensated than those in the private sector. The report reveals that the lower your educational level, the better off you are working for the federal government. Those without a college degree get the best deal - a compensation package 36% higher than an equivalent non-government employee. For these folks, wages are 21% higher, and benefits a staggering 72% higher, than those in the private sector. All of which is paid for with your tax dollars, of course. The analysis, however, appears to have omitted two things. While the accumulated benefits included health insurance, retirement benefits, and vacation pay, it's not clear whether they contained sick pay and holidays, both of which are usually much more generous for federal employees. You might have noticed that public employee unions are the principal sponsors of legislation to impose generous sick leave, family leave, and holiday pay regulations on private sector employers. This is not an act of benevolence; it's an act of self-protection. Possibly the largest benefit to federal employees is completely absent from the study: the airtight security of a federal job. Every year, only 1 in 5,000 federal non-defense employees is let go for poor performance. (And yet somehow, I manage to run into most of the poor performers!) Apparently, the lazy and incompetent only work for private companies. Reaction was swift from the protected class. Colleen M. Kelley, President of the National Treasury Employees Union and a member of the Federal Salary Council, addressed the issue in an opinion piece in the Washington Post. Unfortunately, after reading her commentary three times, I have yet to discern a meaningful and coherent argument. Our elected representatives in Washington - except, of course, President Obama and his Democratic buddies - have started to confront this issue. The House has introduced 14 bills (and 11 by the Senate) addressing issues related to federal employment. This includes aspects of their compensation packages along with the huge increase in the number of government employees hired under the Obama Administration. Naturally, there's little hope that Senator Harry Reid will allow a floor vote on any of these bills as part of his year-long commitment to accomplish nothing in Congress. Still, our employees are feeling put upon. At a recent labor conference, the same Ms. Kelley said: "Every time we turn around, this Congress is proposing to reach into your pockets to pay for yet another fiscal problem." Senator Sherrod Brown (D-Ohio) has chosen to align himself with the federal employees instead of the hard-working taxpayers of his state. Speaking after the same conference, Brown asserted that federal employees didn't cause the government's financial problems, and therefore shouldn't have to pay to fix them. Mr. Brown will certainly be receiving a ton of money from these unions. Hopefully, Josh Mandel, who clearly understands that overpaying 95% of the federal workforce adds significantly to our financial mess, will defeat him in the fall. It will take a new President to solve the problem of an entitled federal worker class. There are far too many of them, they callously don't pay their taxes in significant numbers, and they're now proven to be grossly overpaid. And yet, they feel aggrieved. What is wrong with this picture? 04/20/12: "29th Congressional District of Texas" with Congressman Gene Green. 04/27/12: "Energy + Environment = A Plan for Texas" with Chairman of the Texas Railroad Commission Barry Smitherman, State Rep. Jim Keffer, State Rep. Mark Strama and Evan Smith, CEO and Editor-in-Chief of the Texas Tribune.